This was the second flight of my international trip to Indonesia (Bali) with my two sisters and their children (excluding Andrew). Kara and Lana were traveling separate to myself. 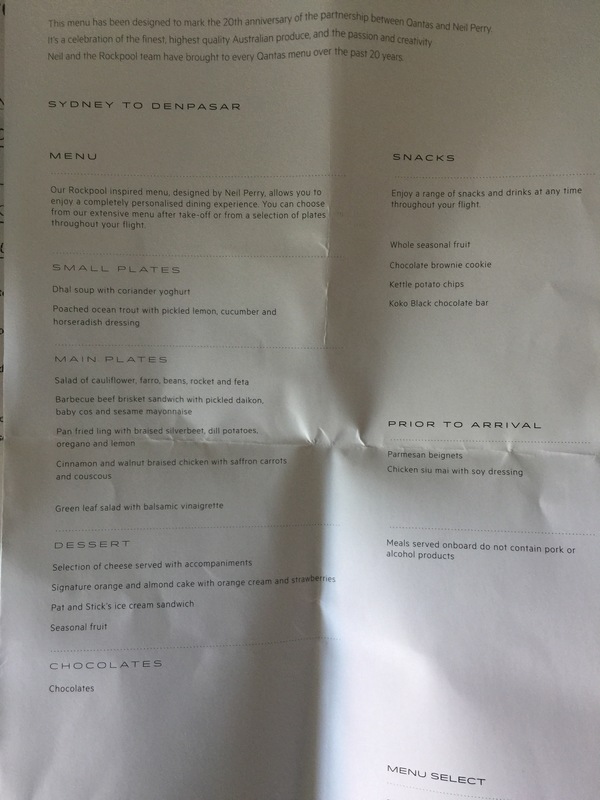 I booked this flight as part of a business class sale and double status credit deal Qantas were running. 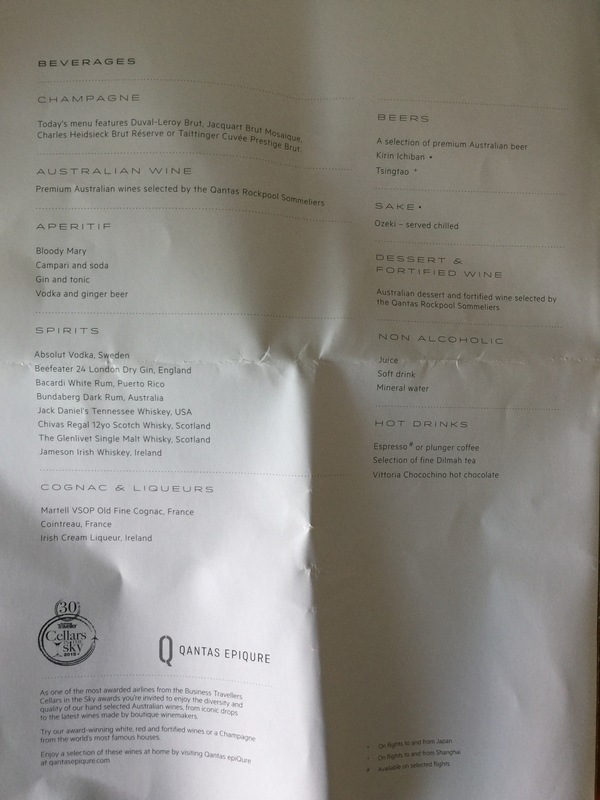 At the end of this trip I’d be a Lifetime Gold member of Qantas meaning lifetime lounge access, priority award seat booking, free seat selection and extra baggage allowance whenever flying Qantas, Oneworld alliance or a Qantas partner. 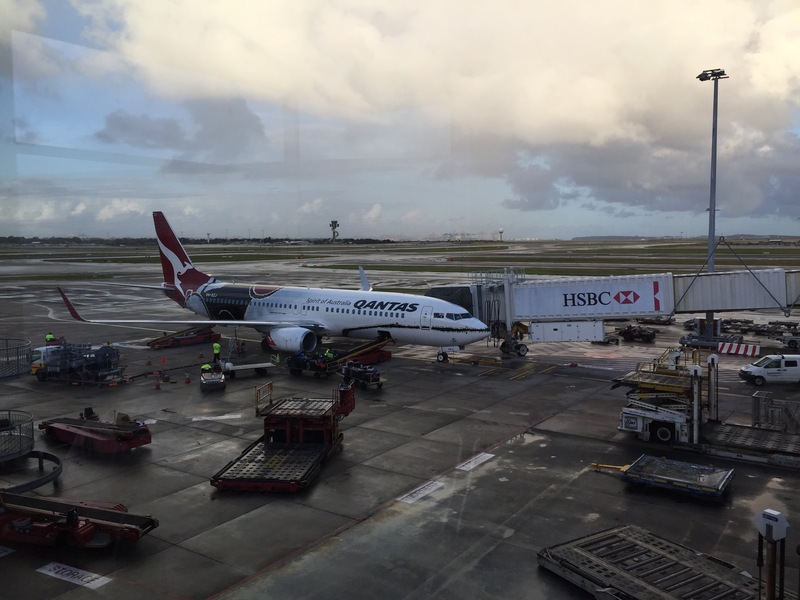 Before boarding this flight I had visited the amazing Qantas Sydney First Lounge (review here) and earlier in the day I had traveled on the A330 to Sydney in business class (review here) which meant I was totally spoiled before this trip. We commenced general boarding at 4.12 pm after first boarding families with small children. One gentleman pushed past everyone waiting in line for general boarding to only be sent back with this is boarding for families with small children. No awareness at all other than pushing past people waiting. I had selected seat 2C as I wanted direct aisle access for this 6+ hours flight. There are three rows of 4 seats in business class (2 x2). The seats are very basic leather seats with a 37″ seat pitch and about 20″ width between arms. Rows 2 and 3 have seat back video screens for the entertainment system. 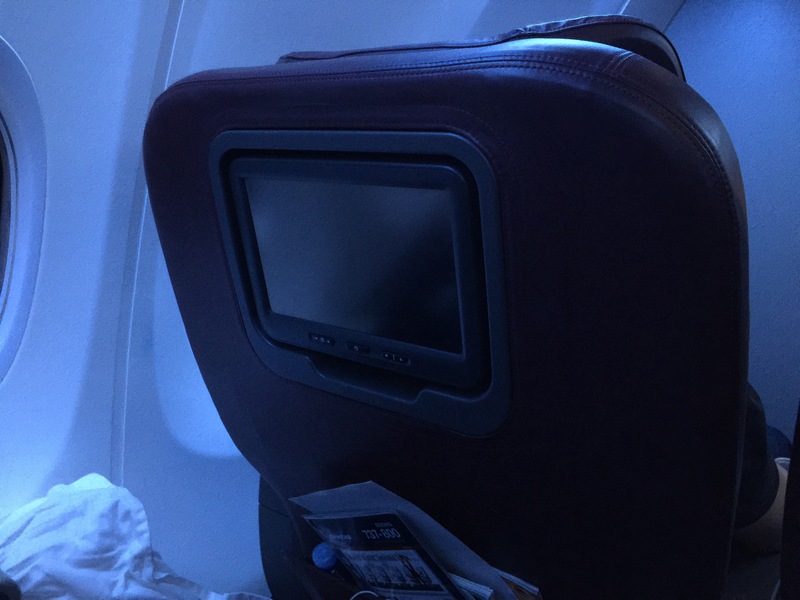 Row 1 has pull out screens from the seat (which must be stored during landing and departure). We were offered water, juice or wine straight after boarding but before push back (which occurred at 16.39). All business class seats were occupied with one seat also have a plus one – a small baby who was great during the flight and liked to entertain other passengers around her. Economy looked like it was 100% full as well so Qantas is doing very well by this flight especially given a Jetstar flight that left at the same time appeared to be near 100% full as well. 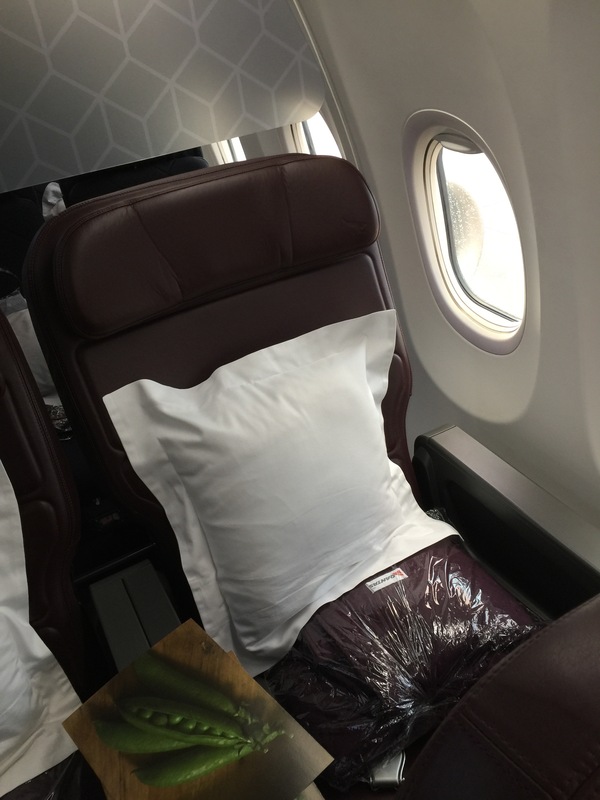 The seats had a pillow and blanket one them which I quickly stored but other passengers in business used. 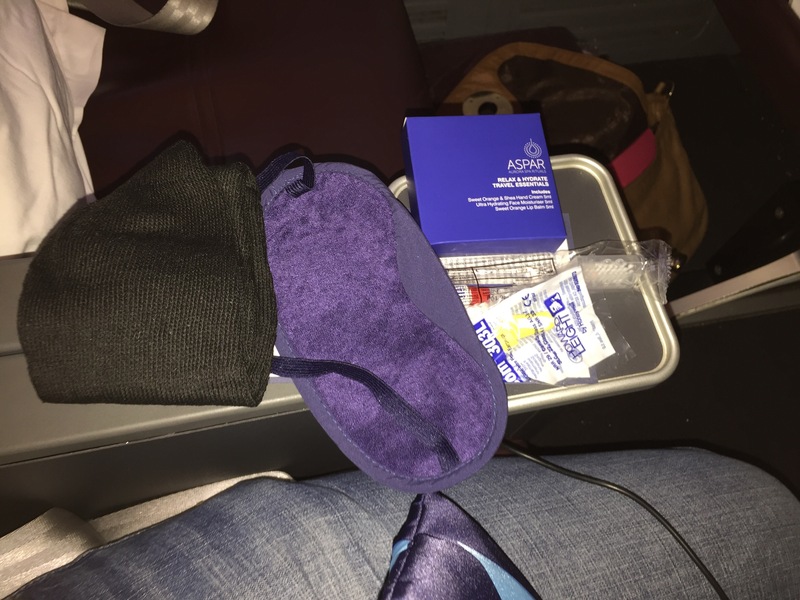 After a smooth take off business passengers were provided with an amenities kit. Included was an Aurora Relax and Hydrate Travel Essentials kit (Hand Cream, Face Moisturiser, and Lip Balm), toothpaste and brush, travel socks, face mask and ear plugs. 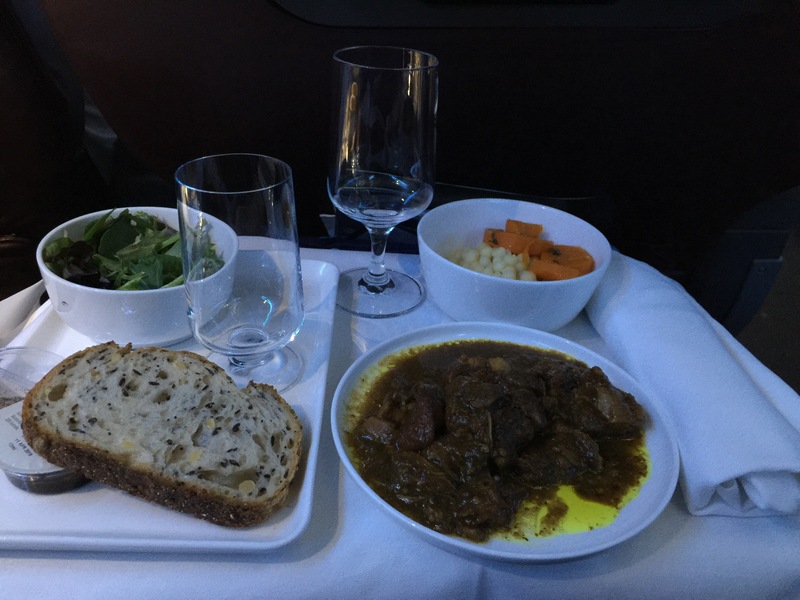 About 40 minutes into the flight the meal service commenced. I skipped entree / small plate having eaten in the lounge. For my main I selected the cinnamon and walnut braised chicken with saffron carrots and couscous. I selected Coke Zeros during and after the meal. For dessert I selected Pat and Stick’s ice cream sandwich. The chicken was fine without being great, but the overall options were more than enough for this 6+ hour flight. The entertainment options were fine although a few more movie options would be good. I watched ‘Passengers’ staring Chris Pratt and Jennifer Lawrence, followed by the ‘Lego Batman Movie’. After these movies I tried to get a few hours sleep. Unfortunately the seats (both 2A and 2C) had significant issues reclining that need staff assistance and given when reclined had barely moved. 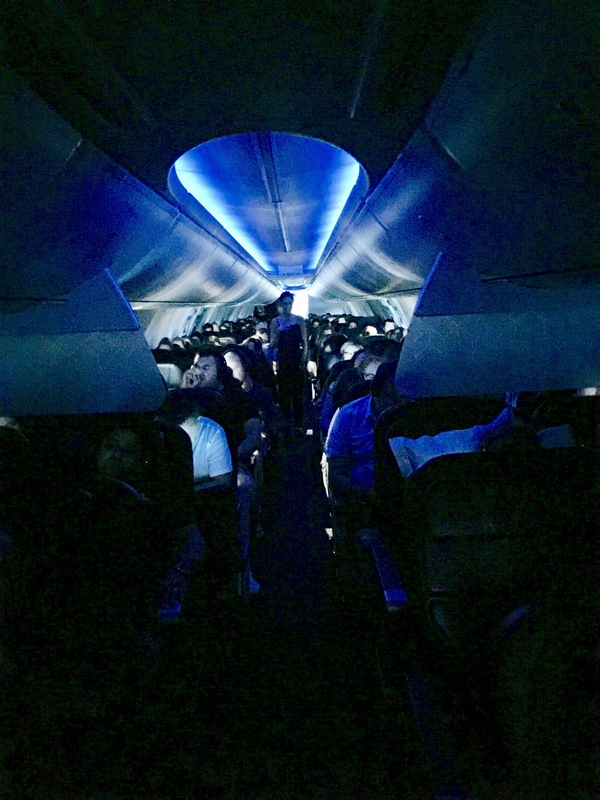 Still they were fine for a flight that started in day time, not sure how good for actual real sleep however. About 45 minutes out from our destination the flight attendants came around and offered either Parmesan beignets or Chicken Siu Mai with soy dressing (basically dim sims) I went with the chicken dim sims. Unfortunately my seat mate in 2A progressively got worst during the flight and had to keep going to the bathroom including just before landing and again while taxing to the gate, the first time I’ve gotten out of my seat with the seat belt sign on but I wasn’t going to get in anyone’s way who is about to vomit! We landed early at 9.10 pm at Denpasar International Airport. The flight attendants farewelled us all by name as we left which was a nice touch. It was a long walk to immigration control and with some many planes from Australian landing within 20 minutes of each other the lines were huge. Still it was easy at border control with friendly staff and my bag was waiting for me to pick up and clear customs without further questions. 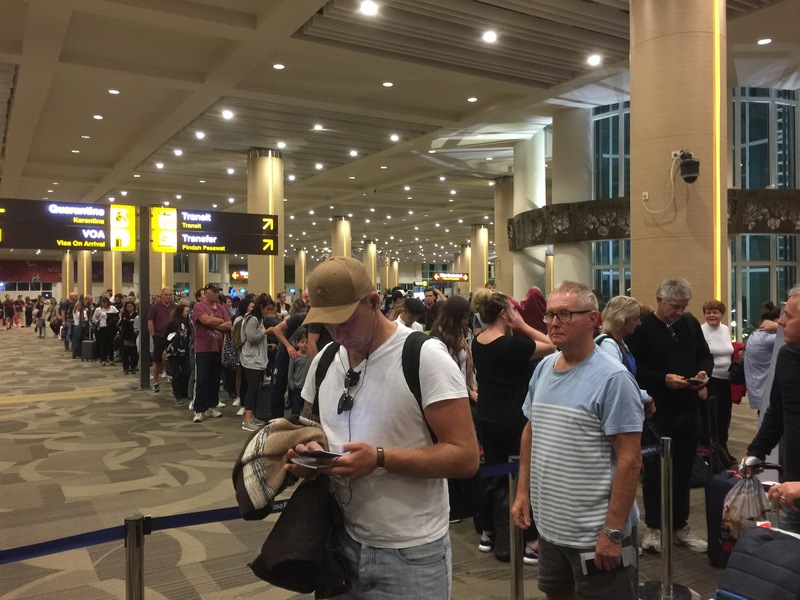 This entry was posted in Bali 2017, Travel and tagged B737-800, Flight Review, Qantas Business Class, QF043, QF43. Bookmark the permalink.